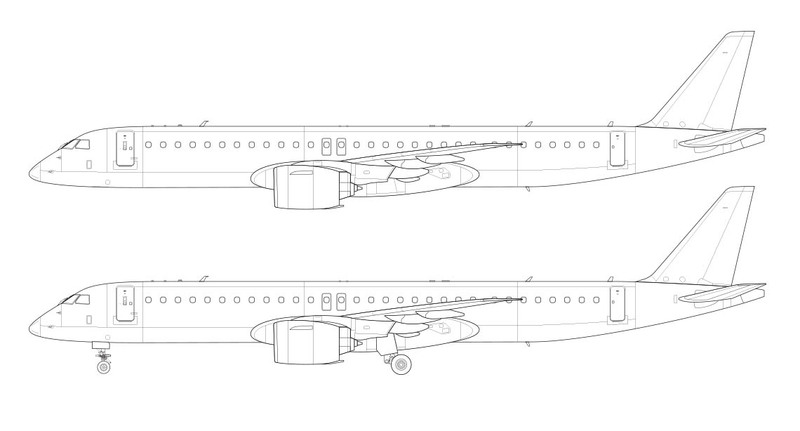 Remember in my last post when I wrote about how much I grew to love the E190-E2 as I was illustrating it? Basically what happened was that it was an aircraft I knew absolutely nothing about, but that all changed once I started gathering reference material for the drawings. With those giant new PW1000G engines strapped to longer wings with beautiful raked winglets, it was suddenly transformed into one of the best looking airplanes ever IMHO. However, I can’t say the same about the E195-E2. The thing that I really liked about the shorter E190-E2 was how massive the wings and engines were compared to the relatively small-diameter fuselage. Additionally, the entire wing box was pushed so far forward (compared to where it was on the first generation E190) that it completely transformed the look. No longer was the E190 a wimpy little airplane with tiny arms and legs – it basically emerged from the second-generation update looking as if it had spent all summer in the gym and was ready to fight back against the bullies from the US and Canada. Unfortunately, the ransformation of the first generation E195 itnto the longer E195-E2 wasn’t as impressive. Yeah, it’s got the same large Pratt & Whitney engines as the 190-E2 got, and the wingspan is actually longer by 4.6 ft (1.4 m). 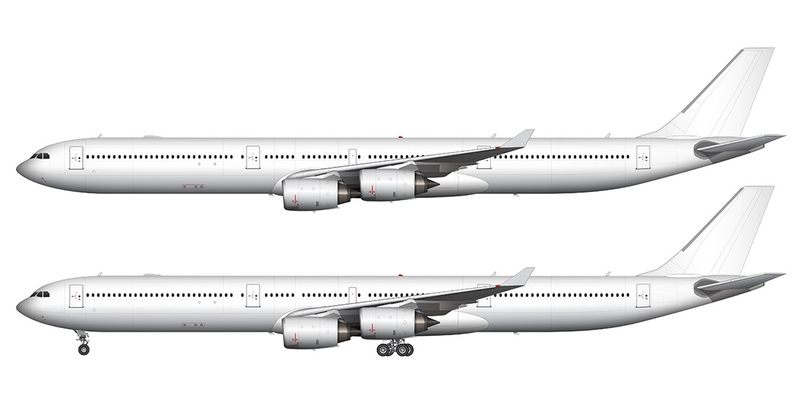 The problem is that the fuselage length was increased by 9.4 ft (2.85 m) over the first gen E195, which is massive and borderline awkward if you ask me. Perhaps if I hadn’t illustrated the 190-E2 first this wouldn’t have been such an issue for me? I don’t know. Before starting these templates, I naively assumed that the 195-E2 would be nothing but a minor stretch over the 190-E2. A few extra rows perhaps, with a few other minor little updates. I couldn’t have been more wrong, because the 195 is a huge stretch over the 190. They should have called it the “350” or something, because just five digits up from “190” to “195” isn’t enough to capture the essence of how massive of a fuselage stretch this is. Yeah, the reference material showed very clearly how awkwardly stretched this airplane was, but no matter. With an open mind and my trusty reference material at the ready, I jumped into the illustration feeling motivated and excited. I was very much looking forward to making progress on my Embraer E-Jet E2 family of aircraft! I believe it was minute 9 was when I finally threw down my Wacom pen and stepped away from my computer feeling confused and irritated. All my dimensions were correct, I was sure of it, but my E195-E2 was looking nothing like the rendering on the Embraer website. What the heck was going on? 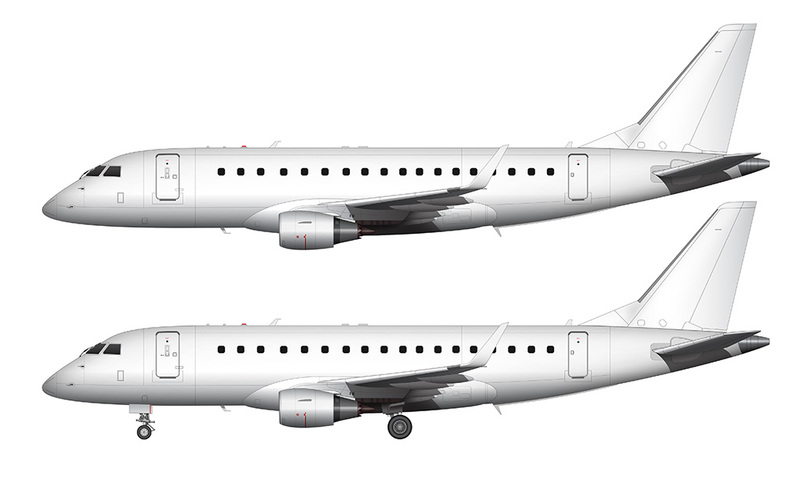 My template was looking long and anorexic (much like the 757-300 and A340-600 does) – and nowhere near as tough and aggressive as that official Embraer E195-E2 rendering. Long story short, that rendering is old and outdated (and they seriously need to update it). Photos of actual pre-production E195-E2’s show a much thinner and longer shilouette with the wing box not as far forward, so those photos are what I decided to base my templates on. 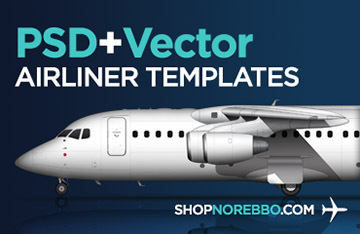 FYI, this is exactly the reason why I never do templates of pre-production aircraft. I like to see the final design from multiple angles before doing any drawings, because throwing down my Wacom pen and stepping away from my computer in disgust is not something I enjoy doing. I can’t help but to start this section with a chuckle, because…well…what history? At the time of this writing (March 2019), this lengthened E-Jet variant is still in flight testing. 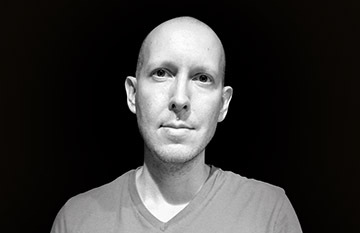 And as it stands at this moment, Azul is set to be the launch customer sometime this summer. With 51 confirmed orders on the books, they’ve got quite a stake in the success of this aircraft. Speaking of confirmed orders, there are 111 on the books at the time of this writing. Azul has the most (51), with AerCap following close behind with 44. For comparisons sake, the E175-E2 has 100 confirmed orders, and the E190-E2 has 47. Note that these numbers are likely to become out of date very quickly, so do check the E2 Wikipedia page for the latest info. As far as the actual history of the E195-E2 goes, the first one emerged from the hangar on March 7th, 2017. It’s first flight was on March 27th of that same year, and was showcased publicly for the first time at the 2017 Paris Air Show. Only one more E2 template to go! Now that I’ve got the 190 and 195 out of the way, my goal for next week is the baby-like 175. I’m actually quite looking forward to that one since I’ve always hated how small the engines on the first-generation 175 were. While the second-generation E2 has a slightly smaller engine (and wing) than the 190 and 195, it’ll be interesting to dig into the details and check out the improvements on a microscopic level. I can only hope there won’t be any Wacom pen throwing! I am lookforward to E-175-E2! I love the E-175! I can not wait to see it with those huuuuuuge engines! Me too! Though I’m not looking forward to drawing the all new wing and engine. I wish it used the same engine and wing as the 190 (because it would make my life a lot easier haha). I can’t wait to see it either! The original 175 looked so wimpy with those tiny engines, so I know I’m going out have fun creating the E2 version.